How much is Sean McVay Worth? 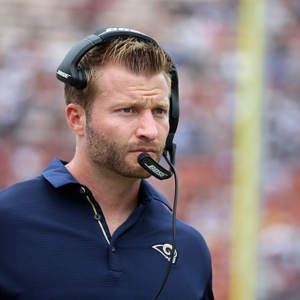 Sean McVay net worth and salary: Sean McVay is an American football coach who has a net worth of $3 million. His annual salary is $2 million. 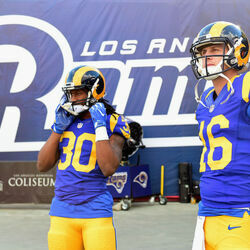 Sean McVay was born in Dayton, Ohio in January 1986. His grandfather John McVay was the general manager for the San Francisco 49ers. Sean McVay played high school football and also played for Miami University. His first coaching job was as an assistant wide receivers coach for the Tampa Bay Buccaneers in 2008. In 2009 he was a quality control and wide receivers coach for the Florida Tuskers of the UFL. McVay was the assistant tight ends coach for the Washington Redskins in 2010. From 2011 to 2013 he was the tight ends coach for the Redskins. McVay was the offensive coordinator for the Washington Redskins from 2014 to 2016. He became the head coach of the Los Angeles Rams in 2017. McVay was named the AP NFL Coach of the Year in 2017. He has coached under head coaches Jon Gruden, Mike Shanahan, and Jay Gruden. Sean McVay contract and salary details: Prior to being hired as head coach of the Rams, McVay was earning around $400 thousand as an offensive coordinator for the Redskins. When he was hired by the Rams as head coach in 2017, he signed a 5-year contract that pays $2 million per year. 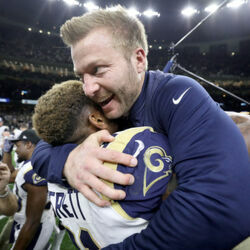 In January 2019, as the Rams powered through the NFC Championship series, the Rams reportedly tried to lock McVay up with a lucrative contract extension. At $2 million per year, McVay is one of the lowest-paid head coaches in the league. For comparison, the league's two highest-paid coaches, Pete Carroll and Sean Payton, make $8 million per year in salary. When he moved to Los Angeles, Sean bought a $2.7 million mansion in Encino, California where he lives with his Ukrainian model girlfriend Veronika Khomyn.